Culturally diverse and densely populated, the City of Lynn, Massachusetts is home to roughly 90,000 residents making it Essex County’s largest city. 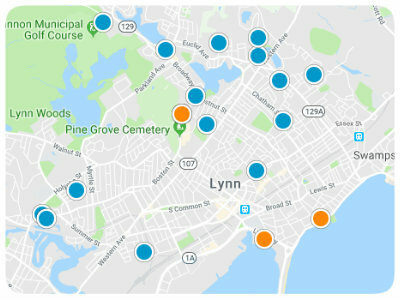 A commercial and urban manufacturing center, Lynn is situated on Massachusetts Bay’s northern shore just nine miles north of Boston on the Atlantic Coast. Bordered by the Atlantic Ocean and Swampscott on the east, Salem and Peabody on the north, Lynnfield and Saugus on the west, and Revere and Nahant on the south, the city is only fifty-one miles from Worcester, ninety-five miles from Portland, Maine, and two-hundred twenty-nine miles from New York City. In addition to this fabulous location, Lynn also boasts a rich history that mirrors that of many New England cities. This rich heritage is well-preserved in its historical society, libraries, museums, and numerous historical landmarks and buildings. Speaking of Lynn landmarks, the Lynn Memorial Auditorium is a must-see state-of-the-art facility which was constructed in 1948. Throughout the years it has hosted an impressive list of recognizable names including acts like Roy Orbison, Frank Sinatra Jr., The Beach Boys, Jay Leno, Pat Benatar, Kenny Rogers, Fats Domino, The Coasters, The Drifters, New Kids on the Block, the Boston Ballet, and Victor Borge. Unfortunately, by the late 1970s, the Auditorium was only being used sporadically for small local events. However, after years of being in decline, a total renovation and refurbishment began in 2002 under the leadership of James Marsh and Mayor Judith Flanagan Kennedy. Since the Auditorium’s restoration, it has once again become a premier entertainment venue on the North Shore. To kick off the ribbon cutting ceremony in 2006 marking the completion of the Auditorium’s overhaul, the Boston Pops and Keith Lockhart performed there. In the days, weeks, and years since the Auditorium has seen performances by Kansas, Peter Paul and Mary, Foreigner, Julio Iglesias, Melissa Etheridge, Toto, Air Supply, Chicago, and many others. Furthermore, it has hosted many exciting non-musicians, such as comedian, actor, and America’s Got Talent judge Howie Mandel. If you are prospective homebuyer looking for available real estate in Lynn, consider the homes for sale near Lynn Memorial Auditorium, and you’ll never be far from the action. For more information regarding available properties near Lynn Memorial Auditorium, please contact us and give us the opportunity to assist you.